POLL: Is Johnny Depp’s ‘Tonto’ a salute or slight to native people? I like you, Johnny Depp, I really do. You were great in Donnie Brasco and amazing in Fear and Loathing in Las Vegas. But lately I’m having second thoughts. This past week a photo emerged of Depp as the classic Native American movie character Tonto in a remake of the famed Lone Ranger films. 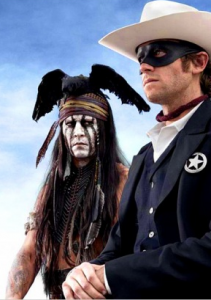 Depp has told media that he intends to ‘salute Native Americans’ and push boundaries with this depiction of Tonto — but that really doesn’t change the fact that it’s a white dude dressed as an Indigenous person, and I really thought we were beyond that. With all the Native American actors in Hollywood, we really couldn’t have cast one for this role? What do you think? Is Depp as Tonto a salute to indigenous people — or is it just plain offensive? stupid. I can believe there hasn’t been more of an outcry against this. You’d almost think there were no First Nations actors. Isn’t Depp’s father Métis? Not that it would excuse the portrayal or anything. I’m curious to know if this film is a parody before I vote. Here’s another entry that suggests, probably not? http://www.avclub.com/articles/here-is-what-johnny-depp-will-look-like-as-tonto-i,70600/ If not, wow, I thought that Johnny Depp took a dive with ‘Rango’. If this film production is as thoughtless as it looks, Depp’s career move is simply over-the-top ridiculously, mind blowingly, baaaaad. Look how Johnny Depp is dressed.. I for one do not like that Johnny Depp thinks that dressing like a Spiritchel leader of a Plans Native American Indian tribe.. is how Tonto would look, This just does not look like Tonto’s tribe at all, as for Johnny Depp being white I can not say if he has Native American Indian blood or not. Unfortunately Johnny Depp is simply an actor. The costume designer and design team of the film make those choices. And more unfortunately, costume designers are only as responsible as their director makes them, with regard to consulting various nations/cultural representatives about appropriating their cultural heritage. However, if Johnny Depp was concerned about the costume designer’s choices he would, ideally, have the right to refuse to wear the costume. I feel like your analysis proves to me that if Johnny Depp has hereditary roots in a particular nation, it doesn’t look like he’s taking any care in connecting to them or learning about them. That’s if this show isn’t a parody. If it’s a parody, comedy takes a big license. But still, I agree that if he’s wearing ceremonial make-up in any context outside of ceremony, that’s just not right. I once wrote in a complaint to Coco Rosie about the same issue. Depp participated in the deeply racist remake of ‘Charlie and the Chocolate Factory’. He is not to be relied on for any sensitivity on matters of ‘race’. As a major Johnny Depp fan and an NDN, as opposed to the inevitable and SO easily spotted “I have native ancestry” WANNABE posers who SURPRISE SURPRISE have shown up in the comments like they do at every powwow telling me all about their fullblood Cherokee/Blackfoot/Lakota great great grandma, yet who never have any clue about the pulse and real spirit of the natives and our perceptions today, I am glad someone is telling it like it is. It’s always the Vanilla Twnkies who love to claim their Pretendian tribe “blood” who have the typical Euro attitude of pooh-poohing and chiding any REAL rez skin who is sick of the stereotypes and racism and points it out. That’s because they have no real connection to our cultures, but only appropriate the title they give themselves for the convenience of making a supposed point supporting their agenda of trivializing our concerns. Every native who lives the culture will understand why putting a bird on it is not gonna make it fly.Especially a bird on top of a costume they stole off a make-believe portrait by Kirby Sattler, a WHITE man who admits he just kind of throws together random “spiritual” and “shamanic” items like a little girl playing dress-up in Mom’s closet, to — you guessed it — “HONOR” natives. PUHLEASE.I would LOVE for JD to be as “Cherokee or Creek” as his family myth “guesses” he is, because he’s so cool and “savvy” and brilliant. But the reality is that, unless he wants to get a DNA test, he has no geneology to support that, is the word in NDN circles who’ve researched it. I hope JD can prove that wrong, but it doesn’t look that way. 1 percent of white people in this country have NDN DNA, and those that do have a TINY bit, so those family myths are just that. And if you have no background of your family being really a part of the culture today, yes, it is racist for someone to play an already stereotypical role who is not native, for obvious reasons. Anyone who doesn’t understand that doesn’t get why Washington Redskins is insulting, either. I had hoped JD would play this in a cool way that turned the jokes on the white man and gave some dignity back to “Tonto,” but unless they have a damn good explanation scriptwise, I cannot see this as being anything other than another slap in the face invitation for rednecks to haul out their racial slurs they hung up finally after John Wayne died. White people and all you wannabes with “native” ancestry (right) who say it doesn’t matter if a native plays a native role do NOT get why it’s an insult that the most famous “native” was Iron Eyes Cody in a litter commerical. An Italian. You don’t get it because of what we’re talking about here. There are TONS of fantastic native actors. But Hollywood WANTS them to be invisible because they have an agnda to present an altered reality that suits the Eurocentric arrogant view that keeps people able to go on blogs and actually criticize us on our own land as mere annoyances when we object to being yet another mascot in a white game. It is as important that it stop this demeaning treatment as they get rid of L’il Black Sambo and blackface. And though Johnny means well, to say he wants to “fix” it by taking the role that a rez NDN actor enculturated could have made better than just a drag show is missing the point. Why do we need a guy with maybe some undefined blood and no embedding into his long-lost “heritage” to represent natives? Get it? Because Hollywood considers natives as fictional of characters still as Tonto. You’re brilliant, Johnny, but give me Denzel as Malcom X. As far back as I can remember our ancestors were portrayed by non-Aboriginal actors on film (especially, starring roles). ii) you’ll be the first actor on the list when we re-do ‘Apache’.. Most of the negative stuff was about the possible butchering of an English classic, a mangling of the near gospel words of the bard by people with Ojibway or Cree accents. Horrors! It’s no longer a limited list of actors like Farmer, Greene, Cardinal, Mojica, and Schellenberg. It’s a growing list of actors who are no longer willing to allow producers to get away with tokenism and worse. Depp is a star. He’s money in the bank. To tell the truth, I can’t remember the name of the actor playing The Lone Ranger. It’s a business decision by Disney to get “a name” with star power to fill the seats. It isn’t about accuracy, or a lack of Indigenous actors, or the unfairness of it all. It’s about money and power and a studio’s ability to mangle what it wants in pursuit of more money and power in that myth factory called Hollywood. Who knows. The movie might even be entertaining and fun. And anyone who believes that the pirate life portrayed in Pirates of the Caribbean was accurate is also missing the point. Hey guys Depp is 1/4 aboriginal!!!!!!!!!!! So he isnt just some white guy, he is connected to them! Actually Johnny Depp is at least 50% Native American not white- Cherokee. He has made several references to his heritiage including the tattoo on his right arm. This may not be is best role . The original Tonto was about 99% racist so either way this is a vast improvement. Do your research before blanketly stating that someone is white. You might be surprised. Just one more claiming to have a Cherokee Princess for a grandmother. How come no one ever has a Cherokee Prince for a grandfather? Not voting in this poll. None of the three choices reflects my view. Used to wonder that myself. The answer must be that, as subordinates, it was considered more ‘fitting’ to take Indigenous women (Metis or quarter-‘bloods’ or less) into the dominant society than it was to incorporate men. Notice the same with African-Americans.